A classic throwback from XenForo 1, Class has been rebuilt to work with XenForo 2. Class brings an educational feel with dark with textured backgrounds. Make content stand out from the structured, gray-toned color scheme. Own Class for XF1? If you have an active license, use coupon code UpgradeClass to receive 50% off Class for XF2. Use coupon code UpgradeClass20 for 20% off Class for XF2 if you have ever purchased a UI.X product based off of XenForo 1.x, even if it’s inactive. Looking for Class for XenForo 1? You can find it by navigating here. Have some nodes better off in 3 or 4 columns? Some that you want full-width? With the Nodes add on (included with theme purchase) have complete flexibility on giving nodes special widths and designs for a truly custom look and feel on your index. Let images automatically fade in and out to highlight several images on your forum. Choose where visitor tabs go for mobile devices. You can either move them into the navigation or a tab bar at the bottom. An optimal design built based on Google’s Material Design standards. Lots of header and navigation customization tools such as background images, sticky navigation, navigation and logo styles, userbar for logged in users, search bar, and more. Add appealing animations as pages load on your site. The various animations can be enabled and disabled. Group pages together in the header to make navigation easier for users. Set where you want an image to have parallax and the controls for it to add a neat effect on your site. You have the control for where various components on your forum are located. Choose the location of your breadcrumb, Welcome Section, notices, title bar, main tab bar, and more! Material Icons by default can be added all over your forum such as node status icons, logo icons, menus, and more. Other icon sets can be added in as well. 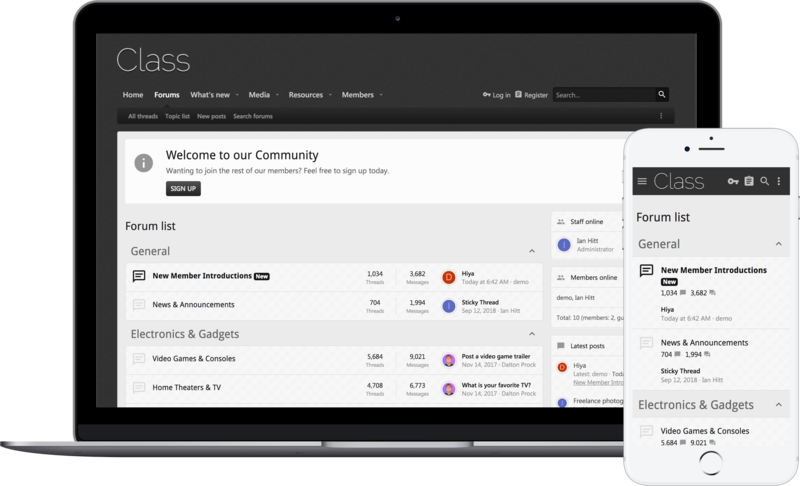 Add a Welcome Section for visitors to your forum to make your forum inviting and provide a simple way to sign up. Customize the layout and contents of your footer. Add Social Media icons that link to your social media pages that can be moved down to the footer or to the logo block. Choose a modal window, dropdown, or slideout login style. Easily customize your forum by putting a content wrapper around the main content, the main content and sidebar, or no wrapper at all. Full sticky component support including sidebar, category strip headings, staff bar and more! Support for languages that read right to left. Collapse nodes, sidebar, postbit, signatures, and extra info under avatars. Optionally enable dynamic avatars based on Material Design's color system. Choose from 3 page style types: fixed, wrapped, and covered. Move the sidebar to the right or left and align your navigation content to either the right or left. Move the sidebar to an off canvas for mobile for better accessibility. Set up your search to be a dropdown style or minimal search. Add headings above normal threads and optionally allows users to collapse sticky threads. Change the postbit avatar size to what fits your forum the best.